When you look around at abundance of moving, strange, sometimes dark paintings at his Eugene Court studio space, it’s a little difficult to imagine that about a year ago, art was merely a side hustle for Sam Wade. 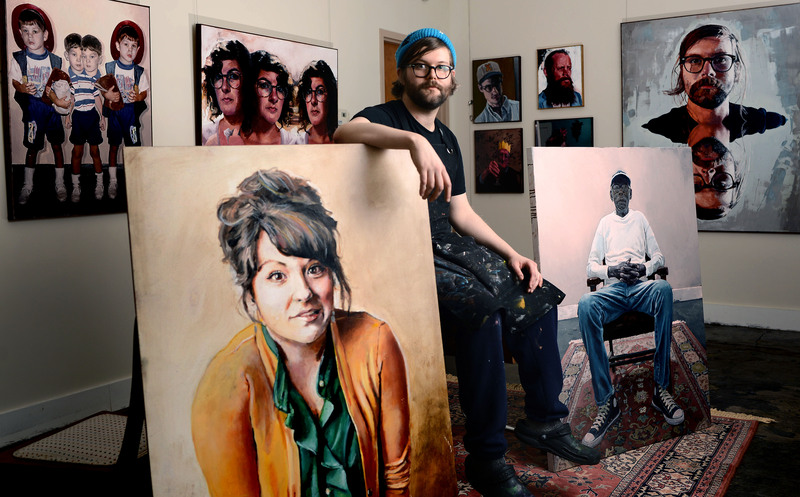 The emotional portraits that line the lobby walls of Foundry Studios and Gallery represent months of non-stop painting by the contemporary realist – Sam’s real-world education and evolution as a portrait painter, in canvases both big and small. They’re his first real attempt to make a go of it in the art world. His work will be on display from May 4 to May 25 at the Center for Visual Artists Gallery at his one-man show. The Greensboro native studied classical guitar at Weaver Academy, and moved to Nashville, thinking he might become a professional musician. That idea quickly faded, and he transferred to Middle Tennessee State to study painting and graphic design. “I stayed out there working terrible restaurant jobs with ever more terrible hours. I tried to do art where I could when I had the chance,” Sam says. He loved creative work. He did the occasional portrait. But he wasn’t paying the bills with it. Nashville, it seemed, already had its favorite portrait artists, and Sam didn’t know how to break in. Last year, a small office space opened in a building Sam’s father owns. 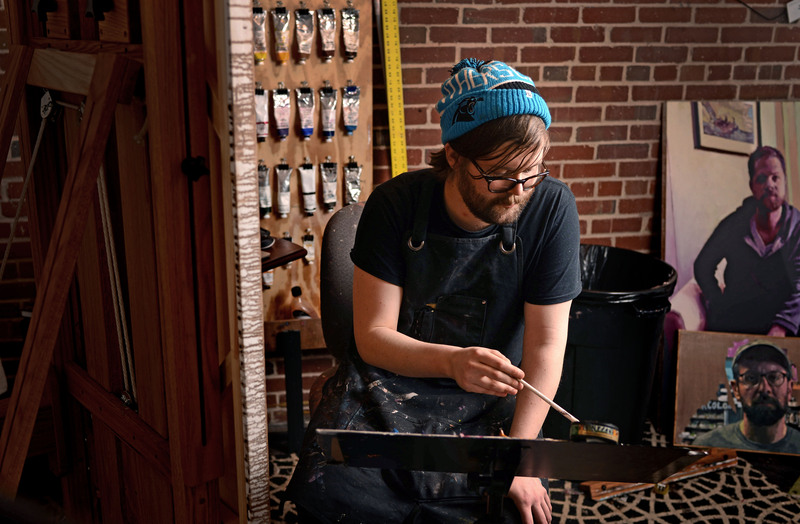 He ditched his life in Tennessee to try art full time, back in his hometown. He reconnected with some old friends, and made some new art world friends. He opened the Foundry, which is now home to three artists. And he started to paint. His subjects are familiar. Family, friends, himself as a child. His technique is a mix of new and old-school tools. Oil paint and photo-editing software. He uses photographs of his subjects, projected onto a large television screen in front of his canvas, for reference. Sometimes he scans the photos and transforms the image digitally before beginning to paint. He only had created about five paintings when he won the unique opportunity to have a solo show at the CVA. He’s spent the last 11 months cramming, at the studio for up to 12 hours a day. 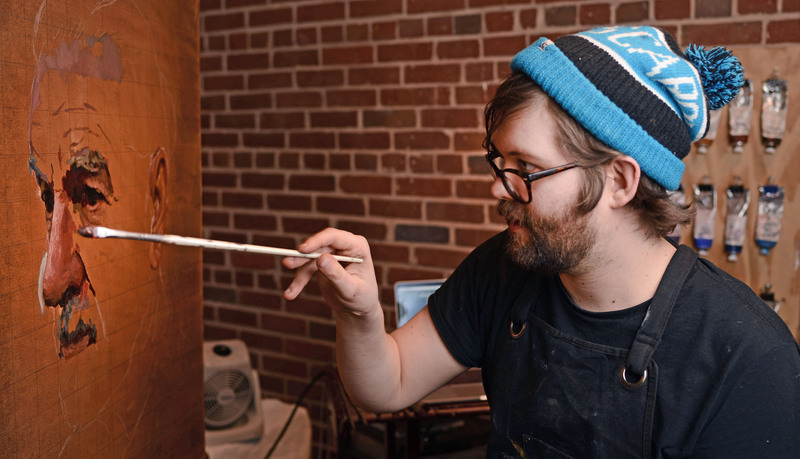 He paints multiple painting at a time, at least five hours a day. “I’ve got 50 paintings at the moment, which is crazy,” Sam says. 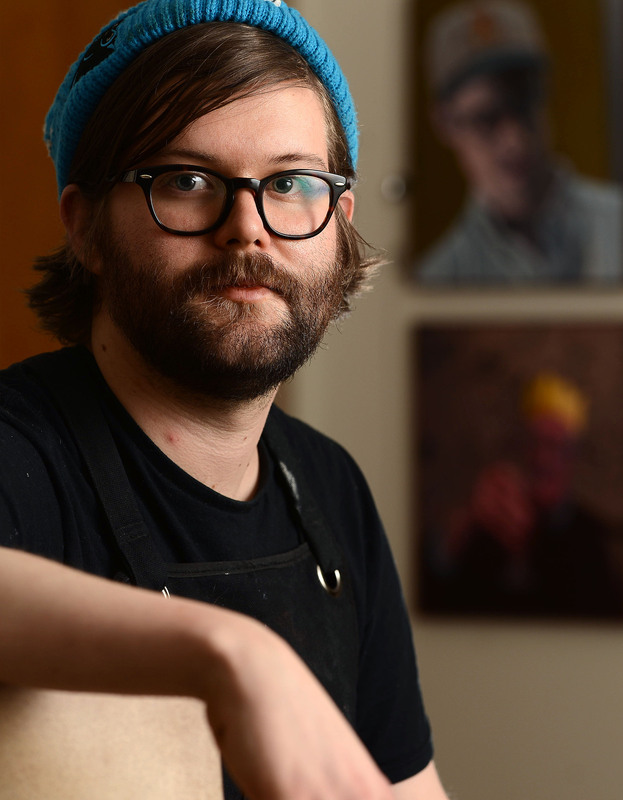 He’s already had some success – selling one of his first and favorite portraits late last year at the Hilary Clement pop-up gallery downtown. Next Post It allows me to be the voice and advocate for those that don’t have a voice.